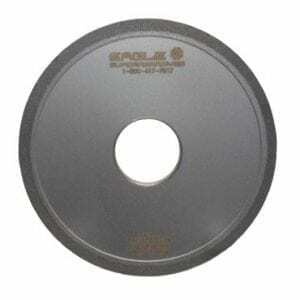 Diamond Wheels are a high-performance grinding wheel when working with non-ferrous materials. We do not recommend working with diamond wheels while working with ferrous materials because the wheel life will be greatly reduced and in some cases wont cut at all. A diamond wheel is specifically used for carbides, glass, ceramics and other non-ferrous materials. Diamond wheels are superior to conventional abrasive materials due to their hardness and fine-grained structure. Properties of diamond make them ideal as a super abrasive because they boast a high wear resistance and extreme cutting edge stability. However, the best grinding performance is achieved if all factors influencing the grinding process are accurately adjusted to suit the operation. These superior performances can be achieved by selecting the correct bond types, grit and concentration of the diamond wheels. Eagle Superabrasives chemist and engineers spend a lot of their time developing and testing different bond methods to fit our wheels. Bond systems are one of the most influential factors in determining your wheels life and performance. Typically a diamond wheel does not breakdown and lose performance because of use. Instead, the breakdown of the bonding layer will cause a subsequent separation from the bond core. Our advanced bonding systems for our diamond wheel lineup are; phenolic resin, polyamide resin, CDX, vitrified, hybrid and metal bond. Our products are designed to not break down prematurely, delivering diamond wheels that last longer to increase your productivity and save you money. With over 6,000 grinding wheels at our Hickory, NC location, we can usually ship 90% of our products the same day. In addition, our experienced staff will provide you with superior customer support and service. They will deliver prompt, insightful technical support and advice on any product you purchase. For high quality products delivered with superior customer service, contact Eagle Superabrasives today!